Destiny6 is the upcoming RPG from Dolmen Creative. 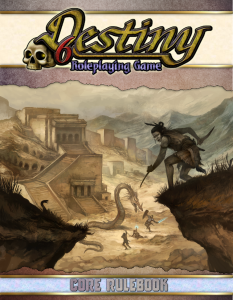 Destiny is a fantasy RPG which uses a variant of the good old D6 system of Star Wars D6 fame. What does this have to do with Blackmoor? Well, Dolmen Creative is owned by Jeff Quinn, who was heavily involved in the D20 Blackmoor line. Being a Blackmoor fan, Jeff snuck in some references to our favorite setting into his new game, including a section of the world map which should be familiar to most of you. 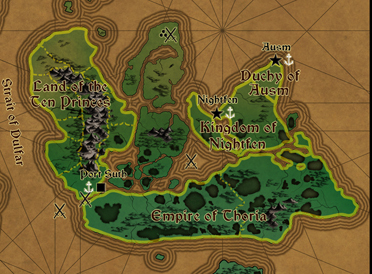 You can download the entire map (10Mb file) using this link. Jeff also promises a series of adventures in the style of the classic adventures he wrote for the Blackmoor line (Ties that Bind, Redwood Scar) and Goodman Games (Idylls of the Rat King) in an upcoming D6 Magazine.